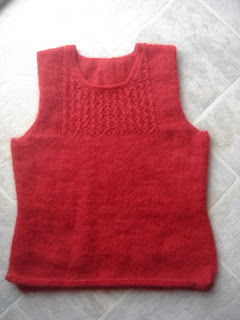 My Knits 'n' Purls World: Let There Be Light! Not only are the Christmas lights now up, there is also a light at the end of the tunnel. The shopping is nearly done, half the presents are wrapped, and I have completed the body on Auburn Mist. Here is a photo of it, unblocked. It fits perfectly! 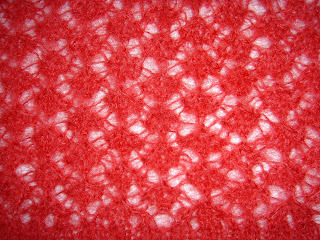 And here is a closeup of the lace pattern. Isn't it pretty? 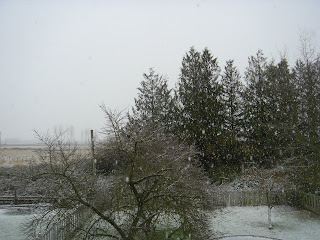 Speaking of pretty, look at the view out my window this morning. Perfect knitting weather to see me through the afternoon, as I cast on the first sleeve. But first things first--lunch!